The Big Lunch aims to get communities together for a few hours of friendship and fun on the first Sunday in June each year. Since starting in 2009, and with support from the Big Lottery Fund, thousands of Big Lunches have taken place in communities right across the UK. In this guest blog, the Big Lunch’s Charlotte Johnstone reflects upon two recent events which have focused thoughts on the meaning of ‘community’ and celebrated the inspiring individuals who’ve brought local people closer together. The debate was chaired by broadcaster and presenter Fi Glover, with contributions from Tim Smit, CEO of The Eden Project, and Jonathan Carr West, Chief Executive of the Local Government Information Unit (LGiU). ‘Feeding the Community Spirit’, the report just released by LGiU about the social impact The Big Lunch has on communities, was the topic of discussion and it sparked a lively debate about the responsibility for community. You can get a copy of Jonathan Carr West’s report by emailing fay.richards@thebiglunch.com. The Big Lunch was last week also proud to hold The Big Lunch Community Awards at Clarence House. These were presented by The Big Lunch founder Tim Smit KBE and Big Lunch Patron, Her Royal Highness The Duchess of Cornwall. The awards were launched to recognise the positive and lasting impact made by The Big Lunch initiative in communities throughout the UK. It was our opportunity to give something back and show recognition of the community action taking place in villages, towns and cities across the UK. 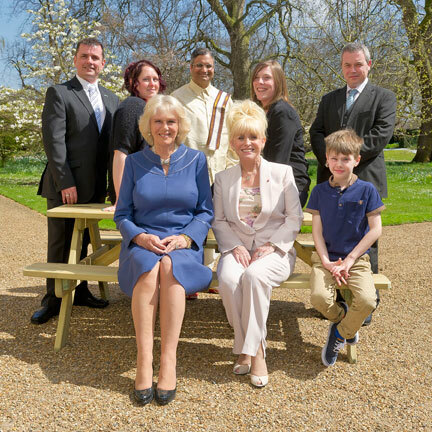 35 nominees were shortlisted and a panel of judges including long standing Big Lunch Ambassador Barbara Windsor selected the 5 winners. These represented all four corners of the UK and the judges said it was hard to make a decision as the shortlisted entries were so inspiring. In alphabetical order the winners were: Martin Sawers and Silvio Solorzano from Atley Court, Northamptonshire, Paul Kerrigan and Conor McCarry from Ballycastle, Northern Ireland, Emma Knight and Joel Al-Hattab from Ethel Street, South Wales, Dr Srihari Vallabhajousula and Mhairi Schmidt from the South Indian Cultural Centre in South Lanarkshire, Scotland, and Jess Phillips and her son Harry from Westfield Road, Birmingham. Jess Phillips and her seven year old son Harry represented the residents of Westfield Road, Birmingham, and were chosen for an award for using The Big Lunch to strengthen community relations after their street fell victim to a series of arson attacks resulting in residents wanting to leave the area. They were invited to share their story on ITV’s This Morning on Wednesday 29 April alongside Barbara Windsor. You can also hear more from young Harry in the above video. Enjoy! To get started for your Big Lunch on Sunday 2 June, just sign up for your free pack.